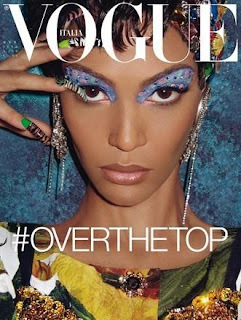 Vogue Italia's March 2012 issue lensed by Steven Meisel marks the very first Vogue cover for Puerto Rican model Joan Smalls. To say that I am ecstatic about this latest development would be somewhat of an understatement. I have been an avid supporter of Smalls from her early modelling days when she was signed by Elite Model Management and relegated to ads/catalogues for the likes of Liz Claiborne, Ports 1961 and Nordstrom. Currently represented by IMG, Smalls looks every bit the star as she primps and poses for Meisel's shutter donning over-the-top eye make-up, accessories and talons. Smalls' Vogue Italia coup comes off the back of a sensational Fall/Winter 2012 show season where she appeared in forty-two shows including Alexander Wang, Joseph Altuzarra, Chanel, Hakaan, Givenchy, Gucci, Fendi, Emilio Pucci and Dolce & Gabbana. With fourteen blue chip Paris Fall/Winer 2012 shows to her credit, I am hedging bets on Smalls securing a Paris Vogue cover courtesy of Emmanuelle Alt followed by American Vogue to make it the ultimate triumvirate.